I NEVER MET SGT. SIMONE ROBINSON. NEVER TALKED TO HER. NEVER INTERVIEWED HER. YET, LIKE ALL MILITARY MEMBERS WHO HAVE DIED WHILE SERVING OUR COUNTRY, I BELIEVE IT'S IMPORTANT TO SHARE HER STORY. AND IT'S NOT REALLY "A STORY." IT'S NOT LIKE I WRITE THIS TODAY - AND FORGET TOMORROW. IN FACT, EACH LIFE IS IMPORTANT. AND EACH PERSON MUST BE REMEMBERED. SO, THANKS TO THE ILLINOIS NATIONAL GUARD, THIS IS WHAT WE KNOW ABOUT SGT. ROBINSON. SGT. ROBINSON, A 21-YEAR-OLD MEMBER OF THE ILLINOIS NATIONAL GUARD, WAS INJURED BY AN EXPLOSIVE DEVICE IN AFGHANISTAN ON JANUARY 17TH. SHE DIED FROM HER INJURIES ON SUNDAY, MARCH 1ST, AT BROOKE ARMY MEDICAL CENTER IN SAN ANTONIO, TEXAS. 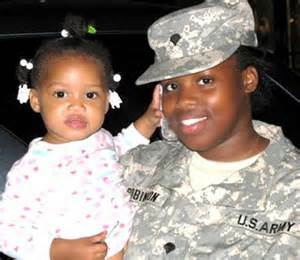 A GRADUATE OF THORNTON HIGH SCHOOL IN HARVEY, IS SURVIVED BY HER RELATIVES - ESPECIALLY HER 2-YEAR-0LD DAUGHTER, NYZIA. ROBINSON'S FUNERAL IS SCHEDULED IN ROBBINS, ILLINOIS, ON SATURDAY, MARCH 7TH. IT STARTS AT 10 A.M. AND WILL BE HELD AT THE GREAT HOPE MISSIONARY BAPTIST CHURCH, 13615 S. LAWNDALE.